See our Systems Thinking Resources below! For descriptions of each of these disciplines, visit the Society for Organizational Learning’s website. To read a more in-depth discussion of Senge’s ideas, we recommend this article from Infed. 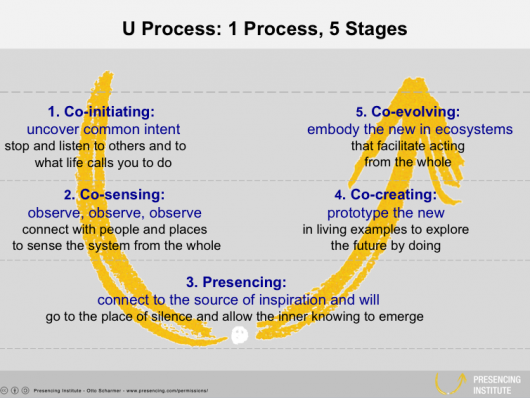 U Process, also know as Theory U, is a useful methodology for collectively approaching difficult problems and developing innovative, appropriate solutions. This process, pictured below, guides participants through a series of steps. It begins by observing reality as it is, retreating and reflecting on those observations, and then enacting a new reality. For more information about U Process, visit the Presencing Institute. This presentation by Dr. C. Otto Scharmer of the Presencing Institute is especially helpful in understanding the theory. Biomimicry is the concept of using natural forms, materials, and processes as models to drive human innovation. Because it has been evolving and perfecting its systems for millions of years, nature can provide powerful examples of sustainable solutions. For instance, an oyster’s mechanisms for filtering water might be used to inform man-made filtration systems, or a forest ecosystem that breaks down and reuses its own detritus might inform the design of a waste-treatment facility. The consulting company Biomimicry 3.8 has a great introduction to this approach to problem solving. More helpful resources can be found at the Biomimicry Institute, their nonprofit counterpart. For teaching and learning resources check out AskNature Resources. If we continue the example of the thermostat above, a double loop thermostat would ask why before altering the temperature–are there people here to enjoy the heat? Are the people dressed appropriately? Could we open or close a window instead? 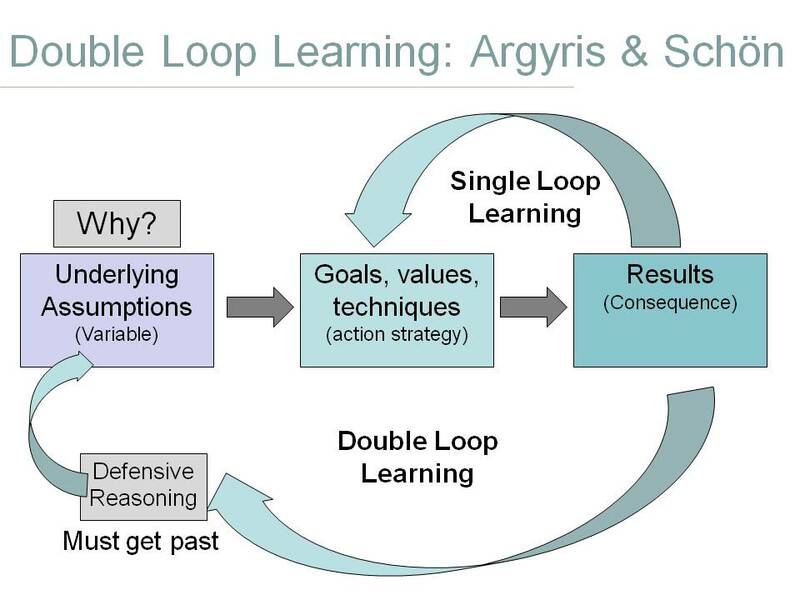 The double loop thermometer takes into account its current environment and situation when making decisions.To learn more about this learning tool, try reading Infed’s article on Chris Argyris or visiting Instructional Design’s Double Loop Learning page. The iceberg model is a valuable tool to encourage systemic thinking and help you contextualize an issue as part of a whole system. 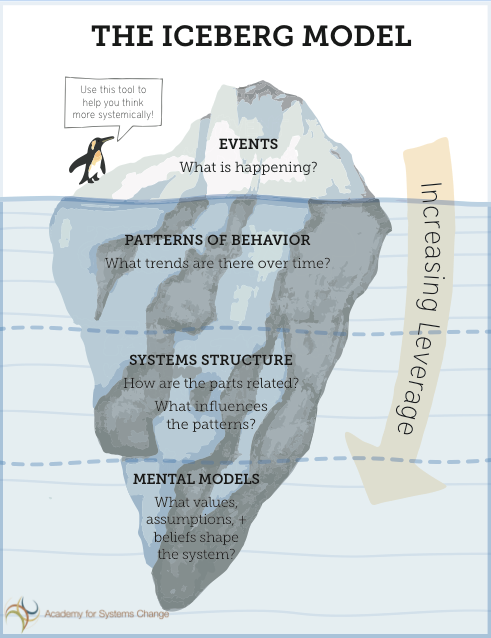 By asking you to connect an event–a single incident or occurrence–to patterns of behavior, systems structures, and mental models, the iceberg allows you to see the structures underlying the event. Just like an iceberg, 90% of which is invisible beneath the water, these structures are often hidden below the surface. However, if you can identify them and connect them to the events that you are seeing, you may be able to develop lasting solutions that target the whole system rather than short term, reactive solutions. We have a copy of the iceberg model hanging in our office. Download this file to print out your own! The bathtub theorem is a useful mental model when thinking about issues like economics and climate change. This simulation from Climate Interactive is an excellent way to familiarize yourself with the theorem while simultaneously learning about the relationship between carbon emissions and atmospheric carbon dioxide levels. Below is a more complex example of a stock and flow diagram that illustrates the volume of living wood in a forest. For more information on stocks and flows and this diagram, read this excerpt from Thinking in Systems. Open Space is a technique for organizing meetings, conferences, symposiums, and community events. Open Space meetings are focused around a particular topic or purpose, but they begin without a formal agenda. Participants are asked to create the agenda themselves by proposing topics that feel important to them, and in this way Open Space events are tailored to the needs and interests of participants. For more information about Open Space principles and hot to use them, read this primer or visit openspaceworld.org. Events hosted using the World Café process are broken into multiple short discussion sessions. During each session, participants meet around tables in small groups to discuss a question posed at the beginning of that round, and then move to a new table with different people before the next round of discussions. At the end of the meeting, insights from the many discussions are shared with the entire group. If you’d like to learn more, the World Café website is a great source of information about this dialogue process. Graphic facilitation is the process of translating complex concepts into a visual language of words and pictures and recording them in real time. This strategy can be a very effective way to summarize and communicate complex ideas and to allow participants to see and internalize the big picture of a discussion or presentation. The following example by graphic facilitator Brandy Agerbeck helps to explain the graphic facilitation process and how it can help clarify and synthesize ideas. For more information, the Center for Graphic Facilitation is a great resource, as is Stine Arensbach’s Graphic Facilitation website. This exercise was inspired by “Envisioning a Sustainable World,” a speech delivered by Donella Meadows at a 1994 Sustainability Conference in Costa Rica. Download this PDF tool to use as a guide for envisioning: a vital first step toward any goal. The Waters Foundation is dedicated to promoting the use of systems thinking concepts, habits, and tools in K-12 schools. They have developed a variety of resources for teachers, students, and individuals interested in increasing their systems literacy. These many resources include a detailed page explaining 13 habits of a systems thinker, as well as their free WebEd course with nine modules that help users develop the systems thinking skills. Teachers can find lesson ideas and even entire lesson plans in their resources section. Creative Learning Exchange is another organization that promotes systems dynamics and systems thinking education in schools. Led by a group of systems thinking leaders, including MIT Professor Emeritus Jay Forrester, the organization offers lessons for K-12 students as well as opportunities for educators to explore systems concepts on their own. In addition, the Creative Learning Exchange hosts a biennial conference on systems thinking in education. As an educator and author, Linda Booth Sweeney has a wealth of experience helping others to understand and work within living systems. Her website provides visitors with accessible materials that help communicate complex systems concepts. It features an extensive list of books and resources about systems thinking, as well as Talking About Systems, Linda’s own blog about systems-related issues.